The telling of the Five Great Lessons is a much-loved Montessori tradition. The stories are typically told at the beginning of the Montessori school year (within the first eight weeks) to Year 1 and other lower elementary students (6-9s), with upper elementary students (9-12s) invited to join in. Many upper elementary students choose to hear the stories every year in the Montessori classroom. These older students often reflect on what they have learned since last hearing the stories. Each Montessori teacher will tell the stories in his/her own way. Although there have been a great many interpretations of the five Great Lessons over the last century, the fundamental purpose of the lessons remains the same: to inspire awe, excitement, and curiosity in the students. To that end, the stories are best told passionately, with a sense of drama and wonder, using gestures, actions, animated facial expressions and vocal tones. This is one of the few instances where the Montessori teacher takes center stage! The Beginning of the Universe and Earth - This story introduces students to the formation of the universe, stars, and solar system, with a focus on the earth’s early development. Life Comes to Earth - This story introduces students to the earth’s earliest life forms and how they adapted to the earth’s changing conditions. Humans Come to Earth - This story introduces students to the appearance of humans on earth. How Writing Began - This story introduces students to how humans invented written language. How Numbers Began - This story introduces students to how humans invented numbers and mathematics. As you can see, there is plenty of material to cover in between the telling of the Lessons. 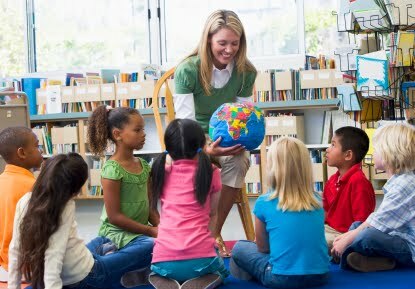 While it is important to tell the First Great Lesson as early in the Montessori school year as possible, time should be left between the Great Lessons to give Montessori students the opportunity to explore the information contained within them. Rushing through the Montessori Great Lessons bombards children with information, thus negating the importance of that knowledge. In upcoming articles, we will further explore the Five Great Lessons and their importance in the Montessori elementary curriculum. © North American Montessori Center - originally posted in its entirety at Montessori Teacher Training on Friday, July 30, 2010. This is a wonderful post and one I'll be sure to bookmark for later learning. I hope it inspires others to enroll and make Montessori a part of their lives. Thank you, Mari-Ann, and congratulations on graduating from your NAMC diploma program! We will certainly follow your blog; kudos for sharing your passion for teaching Montessori!